Rodrigo Diamanti, head of the human rights organization "Un Mundo sin Mordaza" (A World Without Censorship) told journalists that Venezuelan Archbishop Edgar Pena Parra, Vatican substitute secretary for general affairs, conveyed the Vatican's support during a Feb. 11 meeting at the Vatican. Archbishop Pena said the Vatican "is willing to help and do everything possible so that this year we may have free elections in Venezuela," Diamanti said Feb. 12 during a briefing with journalists at the Italian Foreign Press Association in Rome. A constitutional crisis reached a critical point following Venezuelan President Nicolas Maduro's inauguration Jan. 10. 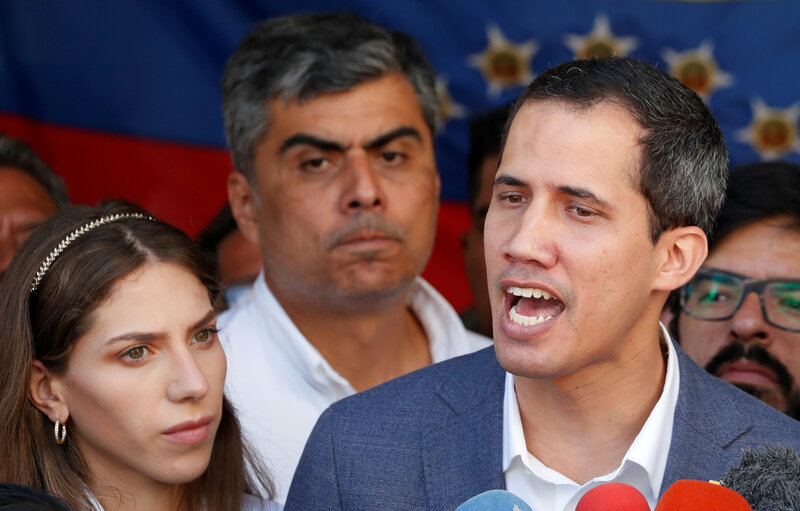 Allegations of rigging by local and international monitors prompted Guaido, who was president of the opposition-led legislature, to assume the presidency. Alessandro Gisotti, interim Vatican spokesman, confirmed the delegation's visit and reaffirmed the "proximity of the Holy Father and of the Holy See to the people of Venezuela." "In addition, the grave concern was underlined that a just and peaceful solution be urgently sought to overcome the crisis, respecting human rights and seeking the good of all of the inhabitants of the country and avoiding bloodshed," Gisotti said in a Feb. 11 statement. Diamanti told journalists that while Archbishop Pena reiterated the Vatican's neutral stance in recognizing either Maduro or Guaido as the country's leader, it does "support the Venezuelan bishops' conference," which has "recognized Guaido as interim president, as per our constitution." In a statement released on the eve of Maduro's inauguration Jan. 9, the Venezuelan bishops labeled his government "illegitimate." "We are living in a de facto regime," the bishops said. "The attempt to begin a new presidential term on Jan. 10, 2019, is illegitimate in its origins, and it opens the door for the nonrecognition of the government." Diamanti told journalists that the interim leadership appreciated the support of the Venezuelan bishops and, while short of recognizing Guaido as president, they understood the Vatican's support for elections. Free elections, he said, "would provide a way of moving forward amid this crisis that is not only human but also political. We need all possible resources because it is not easy to leave a dictatorship like the one we have in this moment." During a news conference with journalists Jan. 27 on his flight to Rome from Panama, Pope Francis said that while he fully supports the suffering people of Venezuela, picking a side in the crisis "would be pastoral imprudence on my part and would cause damage." "That is why I had to be -- I don't like the word 'balanced' -- I must be a shepherd to all, and if they need help, then they must come to an agreement and ask for it," he said. The pope said he thought carefully about his words to the people of the country because "I suffer for what is happening in Venezuela in this moment." I can understand the reluctance of Pope Francis to explicitly approve of Juan Guaido of the National Assembly's opposition efforts. I'm glad however that the Pope has endorsed free elections. I'm a pro-life Catholic who supports the maximum human rights possible for all, both before as well as after birth. So, I appreciate the need to be cautious and not inadvertently cause bloodshed between President Maduro's illegitimate regime and Guaido. However, Pope Francis once said, "Politics, according to the Social Doctrine of the Church, is one of the highest forms of charity, because it serves the common good...A good Catholic meddles in politics, offering the best of himself...But what is the best that we can offer to those who govern? Prayer!" I join Pope Francis is calling for prayer for the success of free elections and human rights in Venezuela.